She texted something like, You should make these. Intrigued, I clicked through to the pastry recipe. It was over in a matter of seconds. 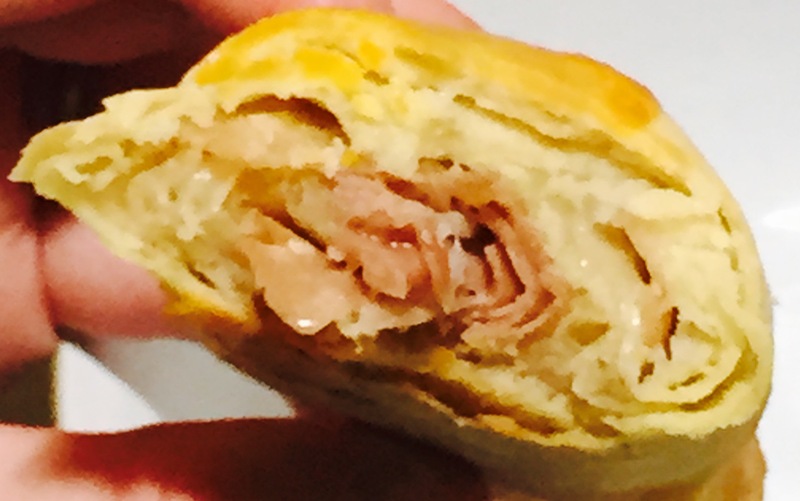 Buttery layers filled with ham and cheese. Fun assembly required. Sold. My lov e affair with croissants started one Sunday after church in the late 80s with a BK Croissan’Wich. Buckled in, feet not touching the floor, I debated my options silently as the minivan idled in the drive-thru line. Dad prompted us for our orders and after I heard my older sister request one, I had to have one, too. Once in my hands unwrapped and steaming, I approved. This bread! Softer than toast, fluffier than a bagel, indulgent like a donut, squarely in the breakfast realm. With one bite, I was hooked on the rich taste and airy texture of this new-to-me pastry. The Egg McMuffin? Dead to me. 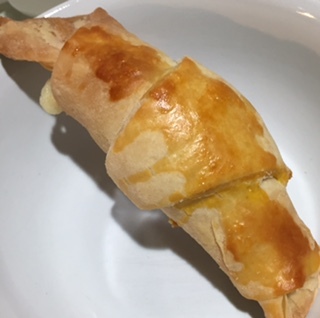 Crescent rolls from a can stood in for years until I reached adulthood and bought croissan ts at bakeries. Reading Julia Child’s book My Life in France and watching the movie Julie and Julia inspired the dormant french chef in me to awaken. It’s still emerging. While I can’t say I pulled a Powell and cooked my way through Mastering the Art of French Cooking, I hold a weak spot in kitchen creations for baking. My friend’s text contained a link to a modified Nigella Lawson recipe. Nigella makes fantastic trashy food, comfort food, a slightly less-deadly Paula Dean. I couldn’t resist. Having conquered my fear of yeast with Parker House rolls and soft pretzels, I leaned in. Counter top cleaned. Ingredients arranged. Dough prep video screened. 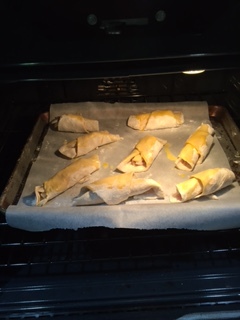 I set about on making some Prosciutto and Gruyere croissants. First, I mixed the milk, water, and egg in a large Pyrex glass measuring cup. Love that thing, so convenient. I sprinkled the yeast over the liquid. While the yeast activated, I pulsed the dry ingredients and chunks of cold butter in my food processor. I scrapped the dough into a bowl and added the yeast mixture. Chilled the dough, experienced the first hurry up and wait feeling which happens with this recipe. No fast lane to Quality Town, more like bumper to bumper traffic because the rising tow truck hasn’t arrived on the bowl scene yet. I frown ed when I realized I wouldn’t be required to beat down my dough like Bobby Flay does with his Parker House rolls. Oh well. 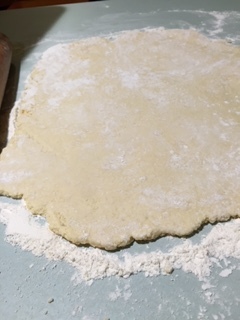 Instead I entered a zen trance of industry: floured my work surface, rolled out the dough, re-floured, and finally folded the dough as if I wanted to re-purpose it as par avion and send it to Flavorville. Cycled through this four times before another big chill in the fridge. 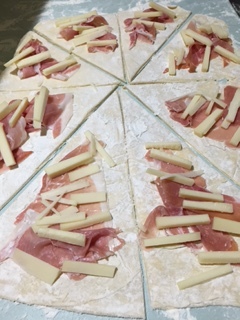 As instructed, I sliced the prosciutto into strips and the Gruyere into thin batons. I decided to change half of the batch to chocolate croissants. I chopped up a bar of 70% cacao for that. The aromatics intoxicated me, my belly grumbled. I pressed the dough into proper form to receive the delectable fillings. The terriers made their presence known at my feet just in case handouts materialized. Arranging the fillings and crosscutting the pastry sheet reminded me of a raspberry rugelach I baked before. Yum. I slipped into my serious oven mitts. The cookie sheet loaded with carbohydrate delight entered the oven. Heavenly smells filled the house as the pastry bubbled up and rose like my expectations. I checked in a few times, all good. Stuffed pastries are like friendship, the inside construction counts most, but you don’t want the outside to be a hot mess either. I’d say these are built to last. What starts your appetite at breakfast? What pastries have you baked? What’s your opinion of recipes by Julia or Nigella? Do you want a croissant now? Tell me about it. Next Post Which Storytelling Medium is Best? this post gets me as excited about making croissants as watching Meryl Streep and Steve Martin do it in ‘It’s Complicated’! Sadly, my skills are limited to heating up the frozen Trader Joe’s croissants…..
Can’t go wrong with the time savings of TJ’s. Sigh. Now I have to go find a bakery, as these will not be appearing from my oven anytime soon. I like croissants only if they are crisp and fresh out of the oven. Eating cold croissants is like eating hardened butter, not very nice. And now I’m hungry lol!! Terrible side effect of food posts!